Aaron Cook Dot Com ™ - Life, Blogging, Money. : Happy Holidays From Aaron! wonderful holiday season full of joy and happiness. 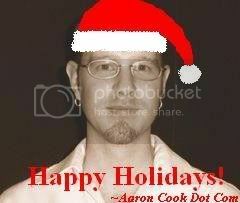 • Happy New Year From Aaron Cook Dot Com! • Happy Halloween From Aaron Cook Dot Com! • The Fireworks Song - Happy Fourth of July!